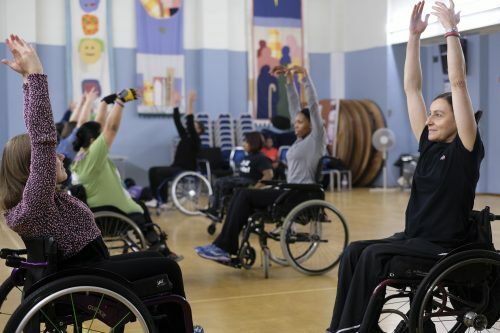 I first encountered Wheelchair Dance at an exhibition given in Italy at the Para Table Tennis European Championships where I was representing Great Britain. 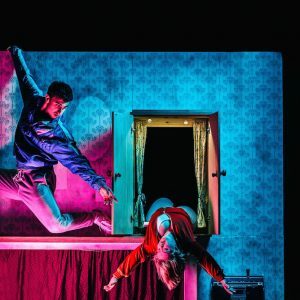 I was captivated by the beauty of it and the freedom it gave the disabled dancer to express herself and to connect with her partner. Afterwards, I sought her out to tell her just how beautiful I had found it, and knew then that this was something I could get excited about. I’ve always loved and enjoyed dancing, always being the first on the dance floor at parties, never stopping until the music ended. When the opportunity came up to train formally with Step Change Studios on their talent programme, I didn’t hesitate to make my case for why, at the age of 49, I was the perfect candidate for a talent programme. Fortunately, it truly did turn out to be inclusive and I was ecstatic to have been given a place on the programme. 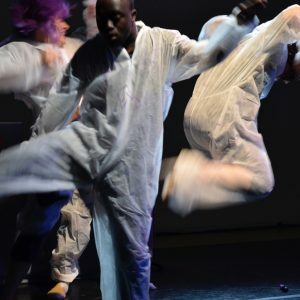 The discipline of learning specific moves, steps and routines, working with a group to synchronise our movement, provided me with a new and exciting challenge. I had to listen for cues in the music, and to learn to count, and count and count. It didn’t come easily and I soon realised I would need to work on what I was learning at home just to keep up. In a small living room, with a carpet and way too much furniture, this wasn’t ideal, but I was able to practise the moves and put them together over time. The familiarity I gained with the basics helped me progress and it wasn’t long before our teacher had us putting together short routines of our own. The sense of achievement in learning and mastering these skills spurred me on and I was soon enjoying learning new dances. Tango, Rumba, Cha Cha Cha, Quickstep, Jive and Waltz provided us with a repertoire of dances and steps to work with in class and at home. 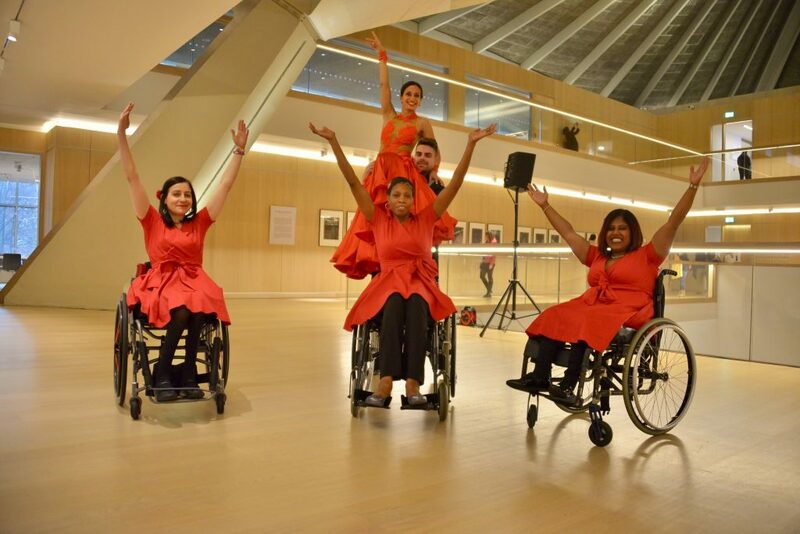 My confidence was growing but still it was nerve-wracking to be asked to join the group in a performance at the Design Museum to mark the UN International Day of Disabled People. My first public performance as a dancer, and a full length routine to learn, rehearse and polish to a professional standard. I love a challenge though, and was determined not to let my nerves get in the way and to deliver the best dance performance I could. By the afternoon of the performance, waiting to start was perhaps the most terrifying part of the process for all of us. We had done all the hard work, but the uncertainty of the unknown was ratcheting up the anxiety. Finally the moment came, the music began, the hard work kicked in and the performance happened. It all went by in a bit of blur and so fast. What had seemed like a huge undertaking was finished in a couple of minutes that felt like a few seconds. The music stopped, and it was over. 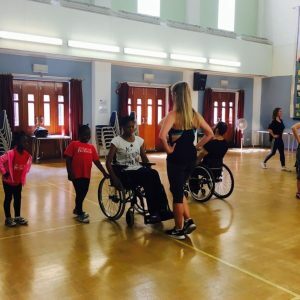 Everything had happened as we had practised, the audience were appreciative, and I had achieved a long held goal: to perform as a wheelchair dancer. The feeling of elation and accomplishment mingled with relief, and I knew this was something I wanted more of.